2018 Ducati Scrambler Street Classic. Picture credits - Ducati. Submit more pictures. The new Scrambler Street Classic develops the concept of self-expression in a setup that pays homage to the 1970s with the attention to details like spoke rims in aluminium and the iconic classic logo. The exclusive Volcano Grey shade is enhanced by the character of the engine with black heads and brushed fins derived from the Scrambler Caf� Racer for a look that blends a vintage touch with contemporary details. 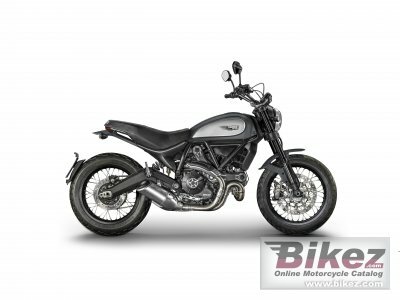 Ask questions Join the 18 Ducati Scrambler Street Classic discussion group or the general Ducati discussion group. Bikez has discussion forums for every bike. View comments, questions and answers at the 2018 Ducati Scrambler Street Classic discussion group. You can sign up for e-mail notifications when other riders answer you. If you have extensive experience with the MC, please send us a review. If you consider buying this bike, you should view the list of related motorbikes Look at photos. Compare technical specs. And check out the rating of the bike's engine performance, reliability, repair costs, etc. You can compare the rating with other bikes.